I didn’t have the energy to do more artwork today, so I picked up Art and Fear: Observations on the Perils (and Rewards) of Artmaking by David Bayles and Ted Orland today.Â It is a small, but fantastic book.Â I’m only 49 pages into it and have already put in 9 Post-its to indicate passages I want to return to, and reflect on.Â Normally a book is lucky if it gets one or two. The reason I picked up the book is that I’m getting anÂ unusual case of artist’s block – unusual for me, that is.Â I know of people who suffer from creative blockages and I am generally not one of them.Â I go through phases of low motivation, but that’s very different from picking up a blank canvas (or cone of warp yarns, or whatever) and having no idea what to do next.Â But that’s exactly what’s been happening for me – I had intended to try painting with acrylics today, and couldn’t do it because I couldn’t decide what my goal was for that particular canvas.Â In short, the ravening “Ohmigod I have no idea what I’m doing – what made me think I could do this – what on earth am I going to do now?” terror was striking again. The answer, of course, is exactly the same as the answer to writer’s block.Â Sit down and paint.Â Paint anything.Â Paint your toes if you are looking down, paint the cones of yarn jumbled on your studio floor, paint the corner of the ceiling but ferchrissake paint SOMETHING! 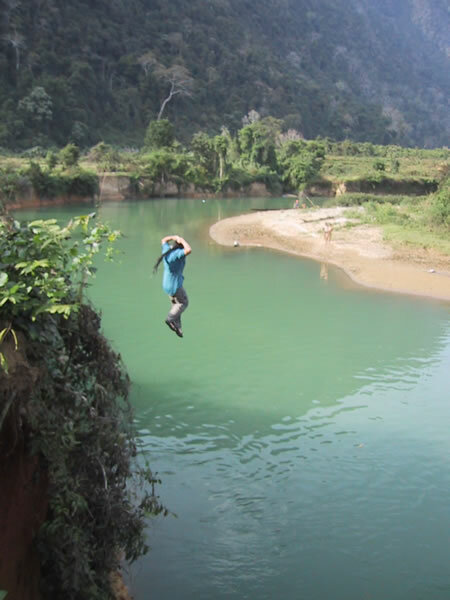 !Â This is what “free writing” exercises are designed to do: get you over that fear by making you write whatever comes into your head, without concern for quality – to get you past that moment of total fear.Â Once you have leaped off the edge of the cliff and are on your way down into the water, the rest is a lot easier. I have been thinking about this sort of thing, not just because it is helpful to my own artistic quest, but also because I’ve been asked to give a program for one of my guilds.Â I am surprised, honored, and racking my brains to think of what I might have to say that would be useful for fellow fiber artists.Â My work is fairly interesting (parts of it anyway), but it doesn’t follow a particular theme, and I don’t have enough experience with any one technique to teach any techniques.Â So it would have to be something less tangible.Â Tentatively, I’m thinking that a program about the artistic process might be interesting to the guild – basically, about the importance of leaping boldly off that cliff, and then (secondarily) about what to do once you’ve splashed into the water and emerged clutching an idea.Â Basically, how to overcome the fear, and how to refine your work through several iterations before getting to a finished piece.Â Â This, more than any technique, is what I know, and I think this process might be valuable. Fortunately, the presentation isn’t scheduled yet (meaning it will be next year at earliest before I have to give it), so that will give me plenty of time to work on, and refine, this idea.Â Or to come up with another one, of course.